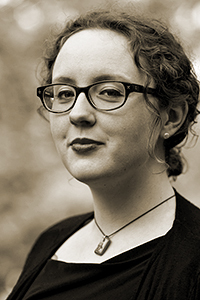 Emilia Phillips is the author of two collections of poetry from University of Akron Press: Groundspeed (forthcoming, 2016) and Signaletics (2013) as well as three chapbooks. Her poetry appears in AGNI, Green Mountains Review, Gulf Coast, Harvard Review, The Kenyon Review, Poetry, and West Branch Wired, among others. She was the recipient of the 2013 Bread Loaf Writers’ Conference Fellowship, the 2013 Mérida Fellowship Award from US Poets in Mexico, and the 2012 Zoland Poetry Fellowship from Vermont Studio Center. Her poetry received the 2012 Poetry Prize from The Journal and the 2013–2014 Emerging Writer Lectureship from Gettysburg College. She serves as a staff member of the Sewanee Writers’ Conference and as a prose editor of 32 Poems. She lives in Richmond, Virginia.